Replacing round bend treble hooks with wide bend treble hooks like pictured here is one of the ways serious crankbait fishermen get the most from their lures. 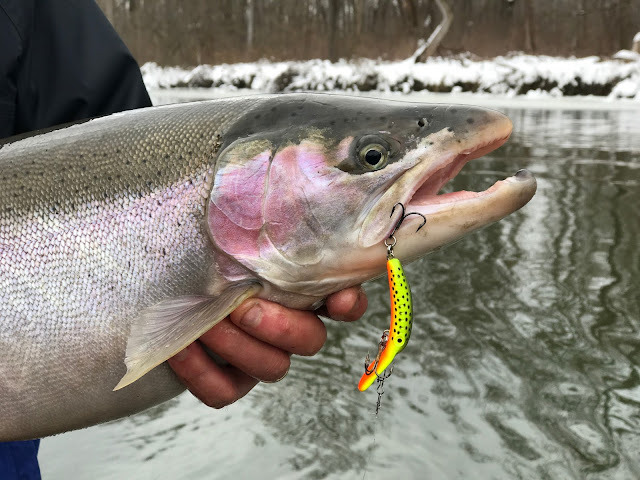 Also note that running double split rings allows the hook to rotate more freely and eliminates a rolling and thrashing fish from gaining leverage and tearing free. About the only time my collection of crankbaits sets idol is when ice covers my favorite fishing destinations. Crankbaits are about as close as it gets to year around walleye lures and my collection of these lures has gotten a little out of control over the years. I currently own so many baits it has become almost a full time job keeping track of them and making sure those baits remain in top working order. Here’s a little food for thought on how to keep crankbaits working at peak performance. I bet there are a few anglers out there raising their eyebrows and wondering if Mark has lost his marbles. Who washes their crankbaits? 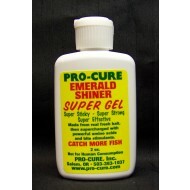 I do and regularly because I use a lot of scent products like Pro-Cure when trolling for walleye and other species. Scent products do a great job of setting up a desirable “scent stream” in the water that gives fish more confidence that those wobbling baits are actually good to eat. mild detergent such as Joy dishwashing liquid. The problem with fish scents is they are greasy and leave behind a film that must be washed away. I use an odor free dish soap like Lemon Scented Joy because it cuts the greasy grime and leaves behind zero scent on my baits. When cleaning lures it’s critical to avoid soaps that have bleach in them. Bleach is a good cleaning agent, but it leaves behind an unnatural odor and can also damage the paint finish on valuable lures. The best way to clean crankbaits is to put a few drops of Joy in a plastic bucket, add a little water and take a scrub brush to each bait. After the baits are washed, rinse them in clean water and set them aside to dry before putting them back into their utility boxes. I work hard at cleaning my lures every day while using them. Not only does this regiment insure my baits hit the water without the baggage of unnatural odors, the natural amino acids in fishing scents can damage the paint finish on lures if left unattended over long periods of time. Getting fish to bite is hard enough. Having those fish escape because a dull hook slips free at the most inopportune moment is inexcusable. Sharp hooks stick and hold fish and dull hooks are a bad day waiting to happen. Spending a little time with a file sharpening hooks is arguably the single most important step an angler can do to insure the fish that bite end up in the bottom of a landing net. I like to sharpen hooks using a double rattail file because it removes material from two sides of the hook on every stroke. I grab the hook with the point facing away from me and push the file parallel to the hook point two or three strokes. This creates a knife edge on the hook that cuts deeper and stays stuck better than the round needle points that come on most of the hooks found on crankbaits. Flat diamond stones that have a groove cut in them to accept fish hooks are another great way to sharpen a fish hook. Metal files tend to remove material faster, so it pays to tread lightly when sharpening hooks with files. Metal files also rust easily and must be lubricated with a light oil often. A flat diamond stone takes a few more strokes and a little more work to sharpen hooks, but these stones last for decades with virtually zero maintenance. A few crankbaits on the market come factory supplied with premium hooks. Most of these baits however are equipped with “adequate” hooks and hardware at best. Re-hooking baits using premium after market treble hooks is a great way to not only insure these baits have razor sharp hooks on them, but also hooks that function better than the run of the mill trebles generally provided on crankbaits. Premium hooks are sharper out of the package. A good example are Eagle Claw Lazer Sharp series of needle point hooks. Chemically sharpened these hooks are “sticky” sharp right out of the package and affordable enough an angler can justify using them generously. In the Lazer Sharp series anglers can pick from wide bend Kahle hooks or traditional round bend style trebles. Wide bend Kahle style hooks tend to hold a little better because the inward angle of the hook point applies more pressure at the point which in turn drives the hook home a little better than round bend, straight shaft hooks. For anglers who are seeking the ultimate in after market treble hooks the Eagle Claw Trokar TK310 is the hook all others are compared to. These hooks feature razor sharp cutting edges in a Kahle wide bend design. 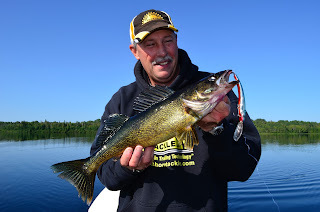 No fish hook is sharper than the Trokar and nothing hooks and holds fish better. Because the Trokar and other super premium hooks are expensive many anglers use them only to replace the tail treble. This option makes sense because most of the fish caught on a crankbait are going to come to the boat hooked on the tail treble. 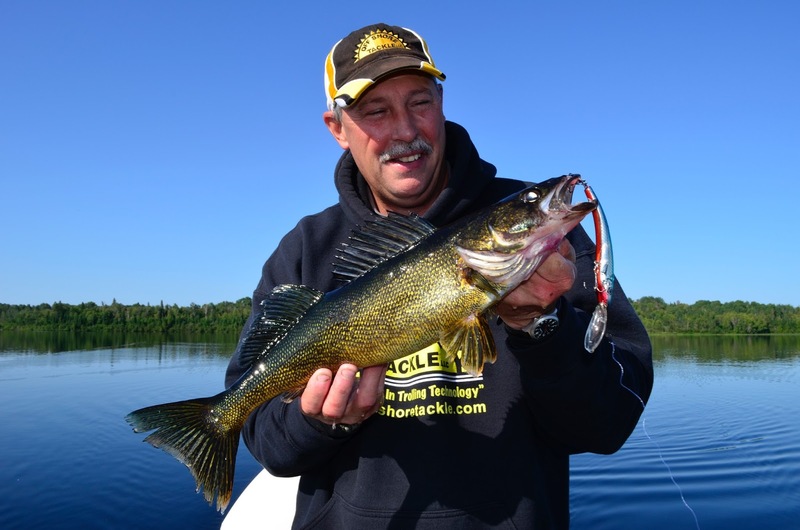 A growing number of anglers are also switching to brightly anodized color hooks. Many anglers feel that using brightly colored red or chartreuse hooks helps in attracting fish to their favorite lures. The jury is still out on whether colored hooks attract fish or not, but confidence is a big part of fishing success. If using colored hooks gives an angler more confidence I can see no reason not to. When I go to the trouble of replacing factory supplied hooks on my crankbaits, many times I’m also going to opt for a replacement hook that is slightly larger in size. Going up one hook size is a good way to improve the hooking ability of most crankbaits. This rule of thumb applies primarily to round bend treble hooks. 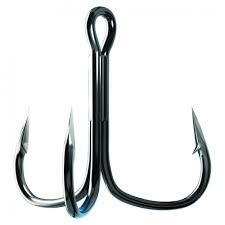 Wide bend or Kahle style hooks already provide a wider hook gap and in turn hook and hold better. In the case of Kahle hooks go with the same hook size provided by the factory on most lures. Increasing the hooks used on crankbaits more than one hook size is risky business. Most crankbaits have a delicate balance that can be easily destroyed by using too large and heavy a hook. Some anglers like to replace the tail treble with a hook two sizes larger and then remove the belly treble hook to compensate for weight and balance. In snag ridden areas it may be a good idea to remove the belly hook on some crankbaits, but it’s also important to monitor the action of these lures closely to insure they are still wiggling the way they should. The split rings used to attach treble hooks to crankbaits are also an issue. Sometimes these split rings are so small they bind on the treble hook, especially when switching out hooks for models one size larger. Using a larger split ring insures that the hooks will hang and swing freely. A few industry insiders go a step further and use two split rings on the trebles of their prized crankbaits. Using two split rings gives the hook more freedom to twist and works to prevent fish from leveraging against the hook during the fight. When using two split rings on a crankbait, be sure to match those lures up with short shank treble hooks. Otherwise the overall length of the split ring and treble hook can lead to problems like the tail hook catching on the belly hook. A good pair of split ring pliers makes it easy to replace split rings and hooks without poking your fingers in the process! I keep a pair in all my boats and also a spare pair on my work bench I use often when tackle tinkering off the water. Most anglers who own a lot of crankbaits store them in utility boxes. In a typical 3700 style utility box I divide the compartments into six spaces and place four lures of the same color in each compartment for a total of 24 baits per box. If I have a lot of faith in a particular lure, I’m going to carry on board with me three or four utility boxes designated for that particular brand and lure model. For most lures I feel confident carrying 24 to 48 baits of a particular brand and model. When I buy new lures I have not yet fished with, I normally start out with 12 baits in six different color options. Then if this lure starts catching fish, I expand on the number of baits I carry and also color options. I also like to print labels to stick on my crankbait boxes so I can identify what brand and model of lure is stored inside at a glance. annual maintenance many anglers don’t think about. Crankbaits are fish catching machines and with a little “tweaking” these lures can be even more deadly. Modifying crankbaits in the off season is almost as much fun as fishing and a great way to hit the water ready for action come spring.